Get your fight week coverage here on Bloody Elbow, as unified lightweight champion Vasiliy Lomachenko defends his titles against Anthony Crolla. On Friday, April 12th at the Staples Center in Los Angeles, California, unified WBA and WBO lightweight champion Vasiliy Lomachenko* (12-1, 9 KOs) will defend his title against former world champion Anthony Crolla (34-6-3, 13 KOs), who is Lomachenko’s WBA mandatory challenger. Lomachenko, arguably the #1 pound-for-pound boxer in the world, moved up to 135 lbs last year and won the WBA title from Jorge Linares in one of the best fights of the year. He rallied from a knockdown to stop Linares in the tenth round. After recovering from shoulder surgery, the Ukrainian star unified titles with Jose Pedraza, flooring him twice on his way to a decision. Loma was scheduled to face IBF champion Richard Commey (28-2, 25 KOs), but Commey had a hand injury that delayed the fight. Anthony “Million Dolla” Crolla became WBA champ by stopping Darleys Perez in a rematch of their first fight, which ended in a draw. After defending the belt vs. Ismael Barroso, the Englishman was dethroned by Jorge Linares, then lost the immediate rematch. He’s since won three straight, including a title eliminator against Daud Yordan last November. I won’t sugarcoat it, Crolla has close to no chance to win this. It’s not that he isn’t a good boxer in his own right, but he’s not a powerful puncher and does not possess the boxing skill to hang with Lomachenko. It ought to be a blowout and anything else would be a complete shock. This fight is just to satisfy the WBA’s silly mandatory challenger rules, and ideally we see Lomachenko in bigger fights later in the year. Now I may not be high on the quality of this matchup, but it is still a chance to watch Loma at work. 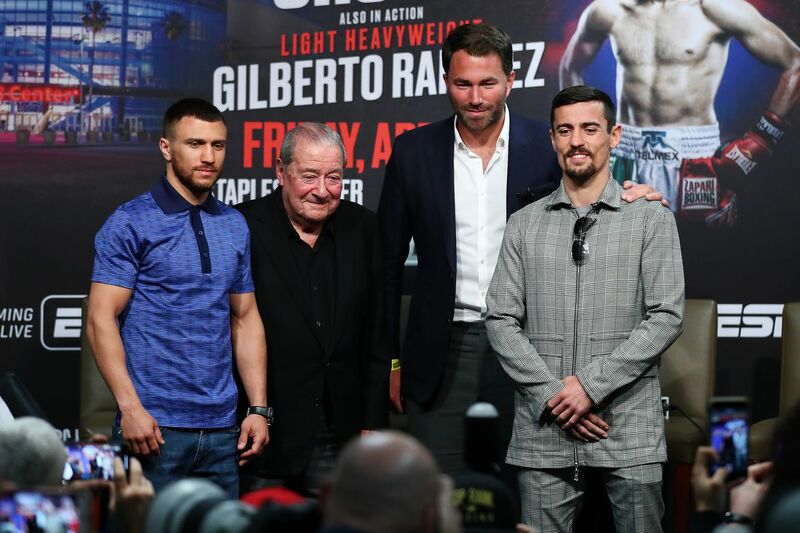 The co-main event between WBO super-middleweight champion Gilberto Ramirez (39-0, 25 KOs) and Tommy Karpency (29-6-1, 18 KOs) represents Ramirez’s debut at 175 lbs. There is talk that “Zurdo” could move back down to 168 lbs to unify titles with Callum Smith, which would be awesome. We will have live coverage of this event, including a preview, results, highlights, and more. *- It turns out Lomachenko’s name is actually spelled Vasiliy, so we’ll be using that from now on.